How Tough Is Your Headache Rack? Describing something as armor-like is a complement to its strengths and toughness. That led us to wonder about the toughness of the headache racks on the real-life trucks that traverse our nation’s highways. If you are a flatbed trucker, ask yourself just how tough your headache rack really is. 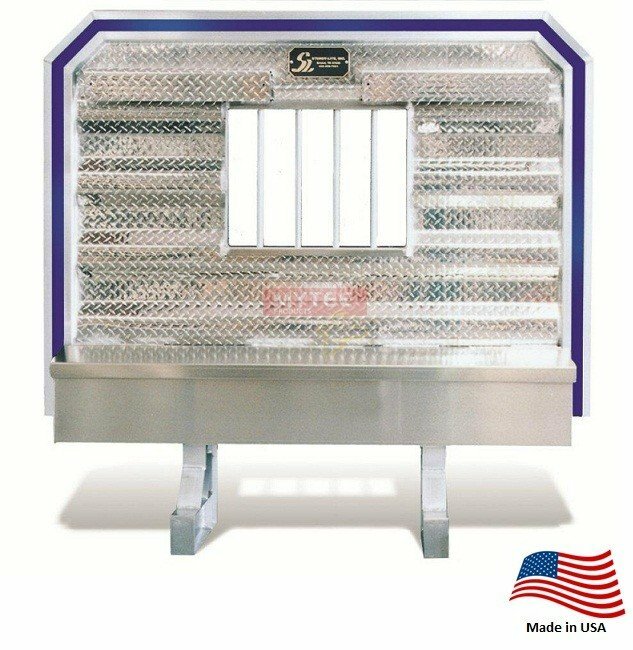 There is a purpose for having a headache rack that goes above and beyond aesthetics.A headache rack is intended to protect both cab and driver in the event that cargo breaks free and shifts forward. The headache rack is supposed to prevent the cargo from crashing through the back of the tractor. With that in mind, a good headache rack has to be up to the task. It has to be strong enough to withstand the forces of physics in the event of an accident. The purpose of a headache rack dictates that function is the priority when buying one. Yes, a clean and polished headache rack is a visual chrome feast for the eyes on a tricked-out truck that looks as good as it drives. But all the aesthetics will not mean much if that freshly polished rack cannot hold up to the forces of a shifting load during a forced hard stop. Truck drivers should buy their headache racks first and foremost as a safety device. After that they can talk about aesthetics and peripheral utility. The headache rack is one area where it does not pay to skimp. So what do you look for while you’re shopping? Start by looking for something made with high-strength, premium alloys. An alloy is a material derived by combining multiple metals or a single metal with other elements. Alloys are defined by their bonding characteristics. Thus, their superiority is found in their strength and durability. An aluminum alloy headache rack is going to be tougher and stronger than a pure aluminum alternative. Likewise for any other alloys a manufacturer might use. Finally, make the effort to visually inspect any headache rack you choose before you buy it. If you are forced to purchase online because you cannot get to the supplier in person, make sure your purchase comes with a reasonable return policy just in case it arrives in less than perfect condition. Your visual inspection should include looking at all the welded seams and the entire face of the headache rack. There should be no cracks or breaks of any kind. The Optimus Prime truck sold in 2016 is nothing but a Hollywood showpiece. As such, whether its headache rack is truly armor-like doesn’t really matter. It is just for looks. The same cannot be said for your own truck. If you are flatbed truck driver, you absolutely have to have an armor-like headache rack to protect yourself and your truck.